Good News! You Can Now Donate Online! We are located in Victoria, BC Canada, and offer several programs to assist local cats and cat owners. If you would like to know more about our background, please read the history of our society. and we do not use our financial resources to assist local governmental animal control agencies. Reduce the stray population by promoting spaying and neutering, and assisting low income pet owners with spay and neuter costs. Operate TNR, Foster, and Rehabilitation programs as resources permit. Educate toward responsible pet ownership. It's back! Our cat spay/neuter blitz for low-income cat owners starts February 15 and runs to March 31, 2019. During the blitz we will pay the full cost of spay/neuter procedures. Please call and leave a message at (250) 656-1100 starting February 15. Feral/stray cats welcome too! Thanks to all who came out or donated to our Christmas Bazaar & Bazaar in November! If you would like to know what we have been doing, please check out our Newsletters. One of our members is selling “Best Friends Fur Life” t-shirts and donating $5 from each sale to The Victoria Cat Rescue Corps Society. Please see our “How to Help” page for more information. We are looking for skilled crafters and sewers who would be willing to make items to sell at our crafts table at our Teas and Bazaars. If you are interested in helping out, please email us at meow.133@victoriacatrescue.com or leave a message at 250-656-1100.
or the mailing address at the bottom of this page. *If you are a compassionate veterinarian who can help our spay/neuter/medical programs, please email us or call 250-656-1100. Thank you! 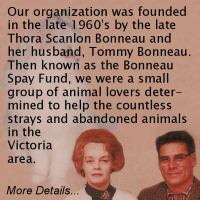 Donations to Victoria Cat Rescue Corps Society are tax deductible. For details on donating, and other ways you can help, please visit our How to help page.